WASHINGTON ― FBI Special Agent Peter Strzok, who was taken off special counsel Robert Mueller's team after Justice Department investigators discovered his texts disparaging President Donald Trump, has been fired from the bureau despite the recommendations of a career FBI official. Aitan Goelman, Strzok's attorney, said in a statement that Strzok was fired late Friday afternoon on the orders of FBI Deputy Director David Bowdich, despite an FBI career official's recommendation that Strzok face a 60-day suspension and a demotion. Goelman called the decision "a departure from typical Bureau practice" and said it contradicted FBI Director Chris Wray's earlier guarantee that the bureau would follow its regular process, despite Trump's disdain for the now-former FBI official. "This decision should be deeply troubling to all Americans. A lengthy investigation and multiple rounds of Congressional testimony failed to produce a shred of evidence that Special Agent Strzok's personal views ever affected his work," Goelman said. "In fact, in his decades of service, Special Agent Strzok has proved himself to be one of the country's top counterintelligence officers, leading to only one conclusion ― the decision to terminate was taken in response to political pressure, and to punish Special Agent Strzok for political speech protected by the First Amendment, not on a fair and independent examination of the facts. It is a decision that produces only one winner ― those who seek to harm our country and weaken our democracy." Strzok exchanged texts with former FBI official Lisa Page that disparaged Trump as well as other politicians, including various Democrats. He testified last month after the release of an inspector general report on the handling of the FBI's Hillary Clinton probe that described anti-Trump texts exchanged by bureau officials. 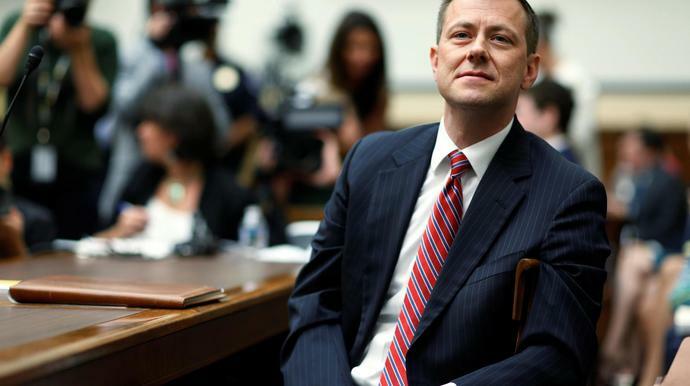 Strzok, a 21-year veteran of the FBI, played a prominent role in both of the investigations surrounding the Clinton and Trump campaigns during the 2016 election. He was involved in the Clinton investigation, which was highly public, as well as the investigation into the Trump campaign and Russian interference in the 2016 election, which the bureau never publicly acknowledged until months into Trump's presidency. Strzok subsequently joined the Mueller team, but left the team as soon as Mueller became aware of his anti-Trump texts. The precise justification for Bowdich's decision to fire Strzok despite the recommendation of the FBI's Office of Professional Responsibility is unclear. But DOJ's inspector general was "deeply troubled" by texts Strzok sent that "potentially indicated or created the appearance that the investigative decisions were impacted by bias or improper considerations," and particularly focused on one anti-Trump text that implied a willingness "to take official action to impact the presidential candidate's electoral prospects." The inspector general report also criticized Strzok for his use of personal email to conduct FBI business. It's possible that the former FBI counterintelligence official's extramarital relationship with Page also played a role in the FBI's decision. Wray said at at a press conference in June that the bureau wouldn't "hesitate to hold people accountable for their actions" after the disciplinary process. Trump celebrated Strzok's firing on Twitter, writing Monday that the investigation into his campaign "should be dropped" and that the investigation into Clinton "should be properly redone." Ryan Reilly is HuffPost's senior justice reporter covering the Justice Department, federal law enforcement, criminal justice and legal affairs. Have a tip? Reach him at ryan.reilly@huffpost.com or on Signal at 202-527-9261.